Proms collaboration between Kennedy and the young musicians from Palestine Strings. 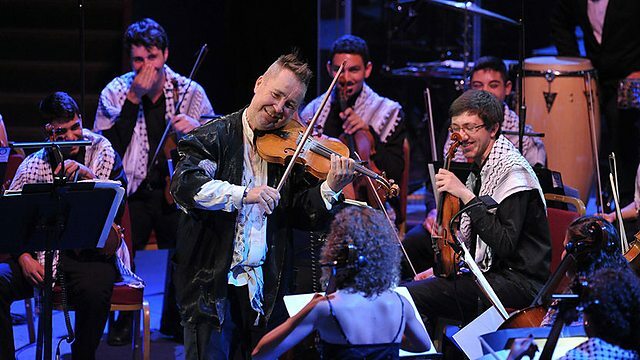 Violinist Nigel Kennedy sent Israel’s apologists into a mighty spin during a Promenade concert in London on August 8 when he used the word “apartheid” to refer to the life circumstances of the young Palestinian musicians with whom he was sharing the stage. Kennedy, an enfant terrible of the classical music world , had not played at the Proms for years but took advantage of a radical mix of programmes this time to revisit the Four Seasons with a number of jazz musicians, his own largely Polish Orchestra of Life and 17 players from the Palestine Strings wearing trademark keffiyehs. Aged between 12 and 23, these protégées of the Edward Said National Conservatory of Music demonstrated considerable artistry in one of the world’s greatest performance spaces. No wonder the Zionist reaction to their mentor’s solidarity comment was so swift and strong. Within days the Jewish Chronicle announced with satisfaction that the BBC intended deleting Kennedy’s remark from its edited TV broadcast of the concert. Baroness Ruth Deech, a prominent Zionist and former BBC governor, had pronounced his words “offensive and untrue” and unfit to be heard during a Prom concert. The BBC, saying they did not“fall within the editorial remit of the proms as a classical music festival,” duly obliged. The critically-acclaimed concert went out on BBC4 on August 23 without the offending comments. In the interim BRICUP chairman Jonathan Rosenhead had joined supporters of Jews for Boycotting Israeli Goods, among them actress Miriam Margolyes and writer/comedian Alexei Sayle, in signing a letter contesting the BBC censorship decision. It was published on August 22 in the Daily Telegraph (scroll down through the other letters to find it here) along with a fair-minded article by the paper’s Religious Affairs editor John Bingham. The Jewish Chronicle named BRICUP and Rosenhead in its coverage. The issue was taken up by wider activist circles with writers’ organisation PEN and Index on Censorship weighing in in Kennedy’s defence. Rock legend Roger Waters of Pink Floyd was moved to issue a long-awaited statement calling on fellow musicians to back the boycott. A petition calling on the BBC to revoke its censorship decision quickly garnered more than 1,200 signatures. Music commentator Norman Lebrecht, himself deeply pro-Israel, picked up the story, calling into question the provenance of a statement in which Kennedy described his comments as “purely descriptive and not political whatsoever” anddenounced the BBC’s “imperial lack of impartiality”. The flighty genius does not own a computer or use any new-fangled digital media so the statement was issued via a musician friend’s Facebook page. As a matter of interest, Lebrecht later posted YouTube footage of the concert, generating serious and largely favourable discussion on his blog. Matters were complicated by Kennedy’s own manager Terri Robson – presumably with an eye to her charge’s potentially lucrative future bookings – publicly suggesting that the BBC was within its rights to censor him. Thanks to links with pro-Palestinian classical musicians who are in contact with Kennedy – he does at least own a mobile phone – we were primed and ready when he once again re-iterated his pro-Palestinian stance in an open letter to the Palestine Strings. He observed that his comment would surely not “have been censored if it had been referring to the benefits of the demise of the apartheid in South Africa when playing with an African ensemble”. This incident, naturally enough, was not deemed newsworthy by mainstream media. Indeed, although the Telegraph’s Bingham refers to “a bitter row over alleged censorship”, others showed zero interest in the BBC censorship story. One late entry into the fray was pundit Dominic Lawson who chose to use his valedictory column in the Independent on September 2 to slag off Kennedy and Waters as part of a sinister army of antisemites holding Israel responsible for all the evils of the world. His attack highlights the care supporters of BDS need to take in the terminology they use. Waters has defended himself expertly when challenged, but drawing attention to Baroness Deech’s Jewish-sounding maiden name (“nee Fraenkel”) rather than referencing her vociferous Zionism, and shooting down a pig-shaped zeppelin emblazoned with a Star of David (albeit alongside other symbols of oppression), has handed ammunition to the enemies of BDS. A call from a small group of German Jews to boycott a forthcoming concert by Waters has won mainstream coverage denied to the injustice done to Kennedy. It remains to be seen, at the time of writing, if any further controversy will follow Kennedy’s planned appearance at the Last Night of the Proms on September 7. Violinist Nigel Kennedy, whose remark about the “apartheid” conditions faced by Palestinians was censored from a BBC Prom concert broadcast, has vigorously defended his comment, adding more fuel to the row about the BBC’s decision. See the Jewish Chronicle’s coverage here and here. Your performance at the Royal Albert Hall was something to be proud of and demonstrated the benefits of people being treated equally as opposed to being decimated and robbed by an apartheid system. As you have seen, there is huge support for stopping the abuse of your human rights. My short comment [about apartheid] was purely observational and humanist. It surely wouldn’t have been censored if it had been referring to the benefits of the demise of the apartheid in South Africa when playing with an African ensemble. Many thanks however to [everyone] for giving a world platform to the important discussion concerning Zionist apartheid. I hope life is treating you ok. We all miss you over here. I’m sorry to hear that the “normal” treatment of Palestinian people by the Israeli authorities led to you being detained for twelve hours. I am looking forward to playing with you again soon and to the days when we can play on a level playing field in Palestine and throughout the world. No further information is available at the time of writing about the detention of the young musicians Kennedy refers to. The BBC has insisted that Kennedy’s “apartheid” remark was cut for purely editorial reasons. But an article in the Jewish Chronicle before the TV broadcast on August 23 referred approvingly to lobbying efforts by Zionists, among them Baroness Deech, a well-known pro-Israel advocate and former BBC governor. The decision to censor has provoked serious online discussion in musical and activist circles, with writers’ organisation PEN and Index on Censorship weighing in in Kennedy’s defence. The Daily Telegraph published a letter signed by 32 Jews opposed to the BBC’s decision, among them actress Miriam Margolyes and writer/comedian Alexei Sayle. An online petition – Don’t Censor the Palestine Prom – has gathered more than 1,100 signatures and remains open. 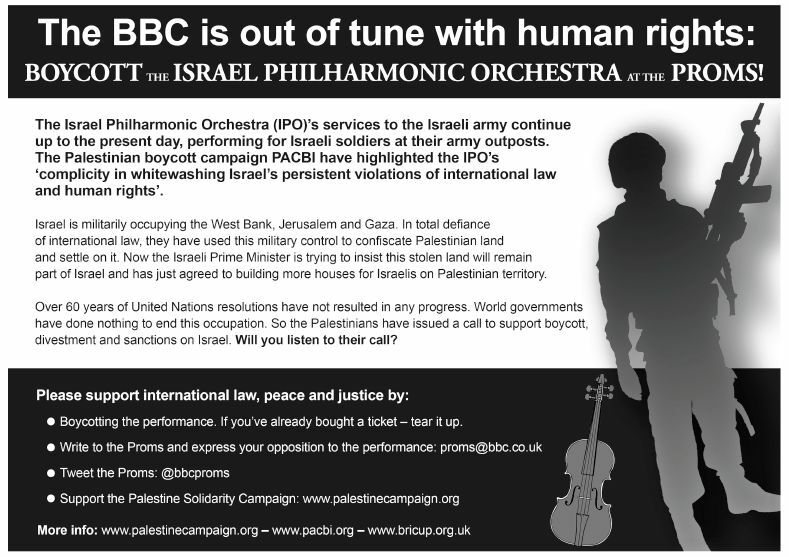 In an astonishingly supine display of cowardice, the BBC has bowed to pressure from Zionist lobbyists and said it intends to cut out an allusion to Israeli apartheid when it broadcasts a Promenade concert by the brilliant and mercurial violinist Nigel Kennedy. Kennedy, a long-standing supporter of Palestinian rights, used the word “apartheid” in a brief reference to the hostile life circumstances of young Palestinian musicians performing with him at the Royal Albert Hall in London on August 8. The concert had indeed shown that, in the face of adversity, Palestinian musicians could hold their own on one of the most prestigious of world stages. Audience reaction on the night was rapturous and reviews by music critics in the Times, Guardian, Independent and Telegraph were overwhelmingly favourable. An in-depth advance piece in the Financial Times had offered a valuable insight into the way music and politics are intertwined in the lives of Palestinian players. It must have been fury at the granting of a such a high-profile platform to Palestinian cultural self-expression that sent the pro-Israel camp into a vengeful frenzy. Marcus Dysch, political correspondent at the incorrigibly Zionist Jewish Chronicle, wrote that former BBC governor Baroness Deech had demanded an apology from Kennedy for his “offensive and untrue” remarks. Even the JC editors thought “anti-Israel rant” was a bit strong, preferring to label Kennedy’s innocuous words a “slur”. This excuse is similar to the BBC’s lame justification for beeping out rap artist Mic Righteous’ shout of “Free Palestine” on Radio 1Xtra in February 2011 and for the last-minute pulling of an advertised TV documentary about archaeology in the Holy Land earlier this year. A campaign is now underway to stop the BBC redacting Kennedy’s offending truths from its August 23 Prom broadcast. Write to BBC chairman Chris Patten (chris.patten@bbc.co.uk or lord.patten@bbc.co.uk), copying the BBC Trust (trust.inquiries@bbc.co.uk) and asking them to make sure your letter goes to Patten and relevant executives. According to the unashamedly Zionist weekly Jewish Chronicle, “a new pro-Israel lawyers group has written to the Metropolitan Police calling for the prosecution of protesters who disrupted a concert by the Israel Philharmonic Orchestra in London last September. “Jonathan Turner, chairman of UK Lawyers for Israel, set up last year, urged the Met’s Commissioner, Bernard Hogan-Howe, to ask the Crown Prosecution Service to act before the March 1 deadline on mounting a prosecution,” the JC said. The protest, by more than 30 campaigners supporting the Palestinian call for Boycott, Divestment and Sanctions, resulted in the BBC halting a radio broadcast from the Promenade concert series in the Royal Albert Hall for the first time ever. As key participants in the action last autumn, several members of Jews for Boycotting Israeli Goods will be waiting with bated breath for their summonses to drop onto the doormat. “What an opportunity to advocate publicly for the boycott of cultural institutions linked to the Israeli state,” said J-BIG secretary Naomi Wimborne-Idrissi, one of 13 protesters who sang an Ode to Boycott during the first piece on the orchestra’s programme. September was a lively month for boycott campaigners, and also for pro-Israel propagandists up their usual tricks of trying to keep Palestine off the agenda. Our campaign against the BBC’s decision to invite the Israel Philharmonic Orchestra to perform a Promenade concert at the Royal Albert Hall continues to make waves. The protest by 30 campaigners inside the hall during the concert provoked far too much much media interest to itemise in detail here. Classical Music magazine gave us fair coverage, and having taken part in the protest, J-BIG secretary Naomi Wimborne-Idrissi was given a generous chunk of airtime on Radio 4’s Any Answersprogramme on Sept 10. The suspension of four musicians from the London Philharmonic Orchestra (LPO) for putting their names to a letter objecting in advance to the IPO Prom has raised a perfect storm of outrage, taking the issue to a far wider audience than usual. None of the four players, two of whom are Jewish, played any role in the concert disruption. Facebook users can now show their support for the LPO4 and it’s not too late to write to the orchestra’s CEO Tim Walker, c.c. chairman Martin Hohmann, at tim.walker@lpo.org.uk. Guardian music commentators Tom Service and Charlotte Higgins ridiculed the LPO’s assertion that “music and politics don’t mix”. A letter to the Daily Telegraph was signed by 117 prominent cultural figures appalled at the LPO action. “Why should it be so dangerous for artists to speak out on the issue of Israel/Palestine?” they asked. Interestingly this paragraph, which appears in the Telegraph online, was omitted from the printed edition. Mysterious things also happened when Ben White, a writer specialising in Israel-Palestine, wrote about the LPO4 in his New Statesman blog (see also the previous post here). The Jewish Chronicle suggested all sorts of sinister shenanigans when it noticed that a line had disappeared from White’s piece querying the reasons behind the LPO’s disciplinary action. This raises some serious and sensitive questions. How do we, as anti-racists campaigning against Zionism and its apartheid-style treatment of Palestinians, deal with the fact that many Jews put loyalty to Israel above principles such as human rights and freedom of speech? To pretend that this is not the case risks playing into the hands of those who see Jewish conspiracies at work everywhere – the flipside of the coin from those who see antisemitic conspiracies everywhere. The best policy must be to come clean – Jews who have bought into the Zionist ideology can be guilty of some shameful behaviour. But they are not alone in that. 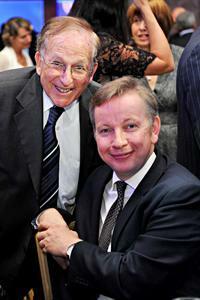 Pro-Israel censorship reared its head in a different setting when the proud-to-be-Zionist (but Christian) Secretary of State for Education Michael Gove (above), acting at the behest of the Board of Deputies of British Jews, forced schools in the north London boroughs of Islington and Haringey to pull out of a children’s writing competition because the organisers included members of the Palestine Solidarity Campaign. Islington MP Jeremy Corbyn and former children’s laureate Michael Rosen, who was to have judged the children’s competition, are both protesting about Gove’s intervention and the local authority’s connivance. Jewish News published their take on the story while the Jewish Chronicle was actively involved in spreading allegations of Holocaust denial and antisemitism. See below for a statement from HARINGEY JUSTICE FOR PALESTINIANS who organised the Tottenham Palestinian Literary Festival and will be campaigning to call to account Gove and the others responsible for wrecking the festival schools programme.  Two weeks ago the first ever Tottenham Palestine Literature Festival could boast a superb line up of acclaimed writers, poets and performers, set to run writing workshops schools in Islington and Haringey and encourage students to enter a writing competition about human rights for children. The competition was to be judged by ex-children’s laureate Michael Rosen and Anna Perera, author of ‘Guantano Boy’. All the celebrated authors, poets, story tellers and actors were happy to waive their fees. Thanks to a malicious campaign of slurs and intimidation from the Jewish Chronicle, some of the workshops had to be cancelled; the writing competition has been wrecked; and children have been denied the chance to write their stories. Rather than learning about human rights, developing empathy and reflection they got a lesson in censorship and the power of intimidation. A journalist from the Jewish Chronicle attacked the festival as anti-semitic and sought to intimidate the schools involved through the Departments of Children and Families in both Haringey and Islington. There was no serious attempt by Education leaders to contact the organisers and find out more about the aims and content of workshops. Weeks of careful preparation and discussion with the schools were ignored. The paper raised ‘serious concerns’ about some of the participants in the festival, many of whom are of Jewish origin, but what these concerns actually are has still not been specified. Instead, Heads and Chairs of Governors were put under intense pressure to cancel workshops, with Islington even threatening one school with legal action. Reem Kilani a leading Middle Eastern and internationally recognised singer is seeking an apology, Michael Rosen will be making a statement shortly and we have had many messages of support. Events at a Promenade Concert in London’s Royal Albert Hall on Thursday Sept 1 did more to bring to world attention the Palestinian call for a boycott campaign against Israel than any single previous peaceful action. 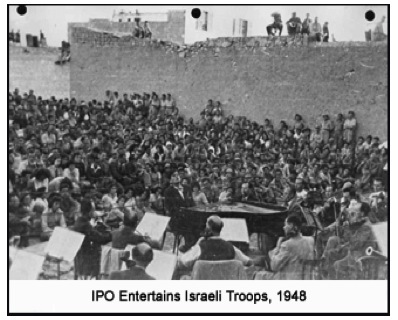 Repeated interventions by small teams of activists from all over the UK substantially delayed the start of two of the four pieces on the Israel Philharmonic Orchestra’s concert programme. The first piece was interrupted as it drew to a close by a boycott choir of thirteen “Beethovians for Boycotting Israel”. A report, including video clips is here. Additional footage of the choir’s intervention can be seen here. It was the BBC’s decision to abandon its live broadcast on Radio 3 – the first time a Prom had ever been taken off air – which denied listeners around the world access to the concert. Although media reports made it appear otherwise, the audience in the hall were able to enjoy everything on the programme, with the added bonus of a rarely heard message in support of Palestinian rights. In July, the Palestinian Campaign for the Academic and Cultural Boycott of Israel (PACBI) wrote to BBC Proms director Roger Wright calling on him to cancel the concert, explaining that the IPO was a boycott target because of its close association with the state of Israel and its armed forces. Further letters went from Israeli activists from Boycott from Within and from BRICUP (British Committee for the Universities of Palestine). The Palestine Solidarity Campaign (PSC) launched a public campaign to halt the concert and mobilised its supporters to mount a picket outside the hall. Meanwhile, members of BRICUP were working behind the scenes with J-BIG (Jews for Boycotting Israeli Goods) and members of the Boycott Israel Network and London BDS (Boycott Divestment and Sanctions) to orchestrate protests inside. Wright paid no heed to the letters he received, replying to every appeal by insisting that the decision to invite the IPO was “purely musical”. Emails sent shortly before the concert to ticket holders showed that he understood full well the political stand he had taken, warning of thorough bag searches and a ban on flags. Even so, activists had no trouble taking their places in the hall and mounting their action. Palestine must now be free. Some audience members snatched letters out of the singers’ hands. All thirteen protesters were ejected from the hall, still singing as the last notes of the piece died away. At the beginning of the second piece, just as conductor Zubin Mehta was raising his baton for soloist Gil Shaham to start playing Bruch’s Violin Concerto, four protesters started calling out slogans. They waved Palestinian flags and called ‘Free Palestine – End the Occupation’ three times, followed by ‘The occupation – Is out of tune – With international law’ while some in the audience tried to drown them out with shouts and boos. Three were led away by security staff. The fourth passively resisted by hanging on to the brass railings along the balcony, continuing to shout Free, Free Palestine as Shaham began to play. The protester was finally forced onto the landing, where staff held him on the floor with his hands behind his back for some time. The violin concerto was then played uninterrupted but after the interval the remaining thirteen protesters, seated in groups of two or three, again intervened, causing a delay of about five minutes to the start of the Albeniz Iberia. Some of the audience were quite irate by this time and some protesters were hit. But there were no injuries and the Royal Albert Hall made no move to involve the police. Radio 3 was on air until about a minute into the second piece, when the BBC halted its live broadcast. It returned briefly after the interval but again went off air once our protests resumed. The fourth and final piece, by Rimsky Korsakov, was played without interruption, but the BBC did not resume broadcasting. Once removed from the hall, protesters joined the PSC picket outside and various newspapers and broadcasters started to show an interest. Our own news release went out in the early hours of Friday morning. While Zionist and right-wing commentators were quick to denounce the protesters as jackbooted Nazi thugs, supporters of Palestinian human rights responded enthusiastically. Israeli film-maker Gideon Gitai posted on a comment thread under a predictably hostile article by music critic Norman Lebrecht describing personal experiences which underlined how richly the Israeli Philharmonic Orchestra deserves to be a boycott target. Has the debate stirred up by the Proms protest been entirely positive for the Palestinian cause? Some campaigners fear the backlash from music-lovers insisting that politics must not be allowed to sully the purity of the concert hall. Extreme Israel supporters have been quick to brand the protest as motivated by Jew hatred reminiscent of the Nazi era, claiming that attacking an Israeli institution is an attack on all Jews. Others take the view that performers so closely tied to the Israeli state do not deserve to play a note uninterrupted and that we have a strong enough case to defend an uncompromising boycott position. The Palestinian Boycott National Committee has laid down the ground rules for waging the BDS campaign. In each particular case tactical decisions must be carefully weighed, but arguments about anti-Semitism and “musical purity” always needs to be firmly contested. Israel, as a matter of policy, deploys cultural ambassadors such as the IPO to throw a civilised veil over its persistent, brutal and illegal treatment of the Palestinian people. Unlike many other vicious regimes that opponents of BDS tell us we should boycott instead, Israel has the ear of western political leaders, newspaper editors and the corporate interests that determine foreign policy priorities. It benefits from scientific, military, academic research and cultural agreements with Europe and has been allowed for 63 years to get away with flouting international law, facing no sanctions of any kind. Palestinians, while suffering the loss of their land, their livelihoods and their very lives, are ignored or grossly misrepresented by politicians and media and gain nothing from European business or institutions other than patronising lectures and occasional handouts to rebuild infrastructure the Israelis have destroyed or to arm and train security forces for Israel’s benefit. Gaza is under siege, the situation in the West Bank, including East Jerusalem, is not much better, Palestinians living inside 1948 Israel are facing deepening racism and refugees are offered no hope of return. Ordinary forms of protest and lobbying have proved totally inadequate in bringing Israel to its senses. Boycott, as in the case of apartheid South Africa, has taken off as THE non-violent form of action available to civil society to end the injustices suffered by the Palestinians. Let’s not forget that Zionists used identical tactics in the early 1980s in their campaign to force the Soviet Union to allow Russian Jews to go to Israel. Music lovers with long memories recall disruption of a Soviet performance of Rimsky-Korsakov’s Russian Easter Festival Overture at London’s Royal Festival Hall. A Russian soprano singing with the BBC Symphony Orchestra was also targeted. Cultural boycott actions, it seems, are acceptable in support of the Zionist cause, but criminal when staged on behalf of Palestinian human rights. A little inconvenience to musicians or concert goers is a small price to pay for getting Palestinian voices heard. And the threat of rising anti-Semitism comes not from BDS campaigners, who are explicitly anti-racist, but from those who insist on shackling Jewish identity to the Israeli state and all its works. Israel devotes massive resources to its public relations war machine, called “Brand Israel”. Supporters of BDS cannot match a fraction of those resources, but by its own actions Israel makes it easier by the day to “Brand Israel” in the public mind as the racist, colonial settler state it is. J-BIG endorses this statement from the British Committee for the Universities of Palestine protesting the scheduled appearance of the Israel Philharmonic Orchestra at the BBC Proms in London on September 1. BRICUP, the organisation promoting academic and cultural boycott of Israel within the UK, today called on promenaders to shun the Israel Philharmonic Orchestra when it plays at the Royal Albert Hall on 1st September. 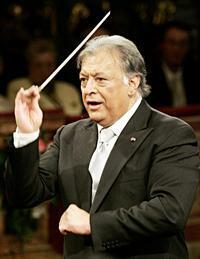 BRICUP was responding to the open letter sent to the Proms organisers on July 18th by PACBI, its Palestinian counterpart. PACBI referred to “the IPO’s complicity in whitewashing Israel’s persistent violations of international law and human rights”, mentioning specifically the IPO’s services to the Israeli army dating back to the ethnic cleansing of the Nakba in 1948 and the occupations of 1967, and continuing up to the present day: “the IPO proudly announces its partnership with the army under a scheme whereby special concerts for Israeli soldiers are organized at their army outposts”. On behalf of the leading Palestinian musical and cultural organisations, PACBI called on the BBC to withdraw its invitation to the IPO. Like PACBI, BRICUP has received no reply from the BBC. “We can only assume they are ignoring us” said BRICUP’s Chris Burns-Cox. “They are mistaken if they think we will just go away. We are now calling on all music-lovers of conscience to boycott this Prom, and to call on the BBC to cancel it. We will be picketing and leafleting outside the Royal Albert Hall on 1st September”. You may already be aware of the call from the Palestinian Campaign for the Academic and Cultural Boycott of Israel for the invitation to the Israeli Philharmonic Orchestra to perform at this year’s Proms season to be cancelled. In case you have not, I attach a copy of their Open Letter. I shall not repeat here the arguments in that letter, signed by an impressive array of Palestinian cultural organisations. They are supported also by British organizations concerned to see justice for Palestinians. Boycott is a non-violent way, requested by Palestinian civil society, to bring the pressure of world civil society to bear on the Israeli public and government. By inviting the IPO, a pillar of the Israeli state system and of its cultural propaganda campaign, you provide the Israeli government, perpetrator of the Cast Lead invasion of Gaza and of so many other violations of international law and of human rights, with the support that they crave.